Maintaining a healthy diet and minimizing nausea during pregnancy can be challenging, especially when traveling. This is particularly difficult when traveling out of the country or far from home where familiar foods may be unavailable or hard to find. That’s why it’s important to prepare ahead of time and have a plan for once you arrive. 1. Pack your own food. The kinds and amount of food you can pack depends on whether you are driving yourself or traveling by plane or other mode. Pack healthy, convenient snacks you can eat while traveling and once you get to your destination. If possible, take a portable cooler with an ice pack so you can pack cold items. The more you can take with you, the more you can be sure you will have healthy, familiar foods that don’t make you nauseous once you arrive – plus it will save you money. Examples of what to pack: fresh fruit, baby carrots, raisins and dried fruit, low-fat whole grain crackers and granola bars, nuts, light string cheese, baked chips, unsalted or whole grain pretzels, snack bars designed specifically for pregnancy (e.g., Bellybar or Oh Mama! ), nutritional beverage supplements (e.g., Ensure or Boost), any specialty foods/snacks you eat – particularly if you have food allergies or a medical condition. 2. Go grocery shopping soon after you arrive. If you are staying at a hotel, request a room with a mini-refrigerator at the very least a microwave, toaster, and/or other cooking accommodations are even more helpful. If you have access to kitchen appliances, you can buy more at the store and prepare your own meals. 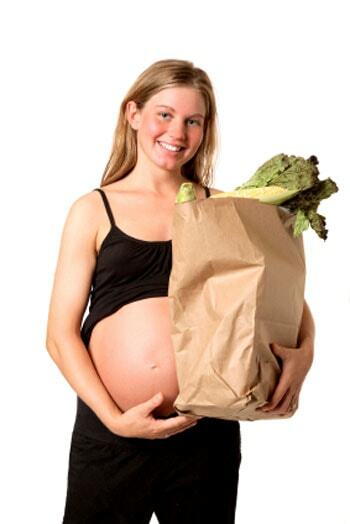 If you are staying with someone, ask if you can use a section of their refrigerator for your “pregnancy food” items. Examples of what to buy: fresh fruit, low-fat milk and yogurt, unsweetened whole grain cereal, whole wheat bread and bagels, natural peanut butter, light cream cheese, reduced-fat natural cheese, baby carrots, cherry or grape tomatoes, snap peas. 3. When eating out, order healthy, “plain” items. You will probably eat out at least a few times while traveling, if not quite often. Choose restaurants that offer nutritious selections, and order as healthy and light as possible off of the menu. Plain, bland foods and those without strong odors – as well as those served cold or at room temperature – are usually better-tolerated and less likely to cause nausea. Ask questions when you are not sure about ingredients or how an item is prepared, and make special requests as needed. If necessary, ask for bland crackers (such as Saltines) or order a carbonated beverage to calm your stomach. Examples of what to order: Breakfast – plain oatmeal with raisins or dry whole grain toast with jam, low-fat milk or yogurt, and a banana or other fresh fruit. Lunch – fresh fruit or a tossed green salad with light dressing (such as vinaigrette) and a sandwich on whole grain bread with lean meat, lettuce, and tomato (or other tolerable veggies), light on mayonnaise and cheese. Dinner – a broth-based vegetable soup, baked or grilled plain skinless chicken breast, plain brown or wild rice, plain steamed vegetables, and low-fat milk. When pregnant and traveling, advance planning is the best way to ensure that you have healthy, tolerable foods available – wherever your travels may take you!